Coffee is one of the most common beverages in the United States and the mainstay of many national coffee shop franchises. Because coffee is popular at work, home and even at events, coffee mugs are often subject to wear and accidents that leave them chipped or scratched. Whether or not these mugs are safe to drink from depends on if the scratch is on the inside or outside of the mug. Coffee mugs can leak dangerous material if they become scratched or chipped. Steel coffee mugs are the most durable beverage holders available. These mugs can be painted or metallic in color and feature either a plastic, insulating material or an all metal design. Steel coffee mugs are designed to take a beating and can follow their owners to work, to the game or even out hiking or camping. If the mug gets scratched, it should be safe to drink from as long as the scratch is on the outside of the mug and doesn't penetrate the cup portion. If the scratch is on the lip of the mug or inside the mug, wash it thoroughly to ensure the mark is not a scuff from a foreign object. If the scratch remains, make sure it is free of metal filings and is not a sign that a plastic finish was applied to the cup. If this plastic finish is scratched, throw out the mug as it could pose a poisoning threat. 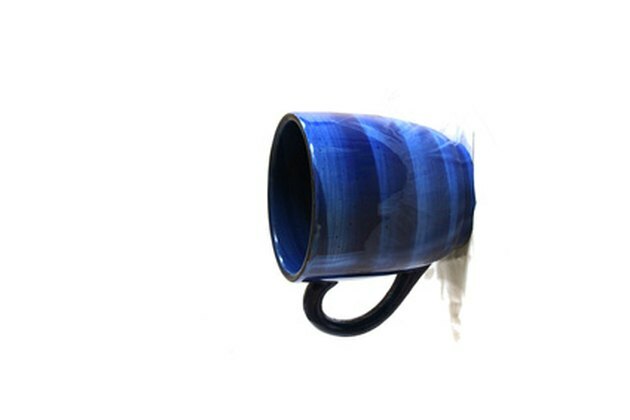 Plastic mugs are made from a variety of polymers, most often polyethylene. This material, which also makes up most water bottles, compact discs and PVC plumbing pipes, can pose health risks when ingested. Although not proven to be dangerous in finished form, a crack, chip or scratch along the inside or the lip portion of a plastic mug can emit trace amounts of plastic substances, such as bisphenol A, or even flake off fragments into the liquid, making the mug unsafe to use. One of the most popular forms of coffee mugs, a painted ceramic or porcelain coffee mug is both inexpensive and long lasting. This type of mug is sometimes painted with a lacquer that contains lead and can be harmful if ingested. Because of this, ceramic coffee mugs should be thrown away if the glaze is scratched on the inside of the mug. Glass coffee mugs suffer the most from scratches. Because the entire structure is often dependent on the integrity of the glass, even a scratch on the outside of the mug can render it unsafe to use. Dangers can range from accidentally drinking splinters of glass to breakage or cracking of the mug if it is full. What Is Porcelain Enamel Cookware?